1 - temporal branch of the facial nerve. 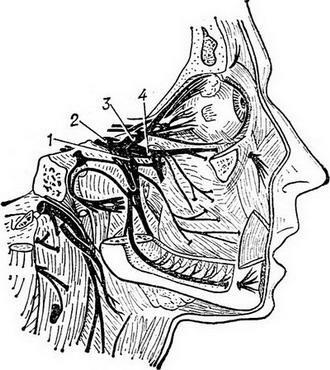 2 - Malar the branches of the facial nerve. 3 - cheek branch of the facial nerve. 8 - the regional branch of the facial nerve. 9 - cervical branch of the facial nerve. VII pair, facial nerve (n. facialis), originates from the core of the facial nerve behind the lid of the bridge. The facial nerve fibers form a loop here (knee), covering the core of efferent nerve. Then they go through the entire thickness of the bridge and come to the base of the brain between the bridge and the oblong brain. Together with the facial nerve at the base of the brain goes intermediate nerve (n. intermedins, XIII pair), bearing taste and parasympathetic fibers. Through the internal auditory hole facial nerve (together with intermediate nerve) is included in the channel of the facial nerve, located in the pyramid of the temporal bone, and penetrates into the thickness of the parotid gland, where it splits into branches (Fig. 3). These branches VII pair nerviruet all mimic face muscles, subcutaneous muscles in the neck and other Intermediate consists of nerve fibers extending from cranked site and ending at the core of a single beam. Dendrites cells cranked site are part of the drum strings. Branches intermediate nerve nerviruet sublingual and submandibular gland and lacrimal gland and together with part of the lingual nerve nerviruet the front two-thirds of the language. In diseases of the peripheral part of the facial nerve affects its branches. The mouth of drag in the healthy side, the lower lip mouth, smoothed nasolabial and frontal wrinkles, eye slit not closed, blink movements are absent. With the defeat of pathways leading from the cortex to the core of the facial nerve, suffering only lower reach him on the opposite side (hangs the corner of the mouth). With the defeat of intermediate nerve violated taste on forward two thirds of tongue, can disrupt sluno - and tearing. VIII pair, predverno-cochlear (hearing) nerve (n. vestibulocochlearis), is divided into two parts - the cochlear (pars cochlearis) and predverno (pars vestibularis). Cochlear part carries the impulses of the organ of hearing and consists of axons and dendrites cells spiral node lying in the bone the cochlea. Predgorny part, bearing vestibular function, departs from the vestibular unit, located on the bottom of the inner ear canal. Both nerve incorporate in the inner ear canal in General predverno-cochlear nerve, part of the brain between the bridge and the oblong brain, near the front and intermediate nerves. Fiber cochlear part ends in the dorsal and ventral cochlear nuclei tires bridge, and fiber predgornoe part in nuclei, located in the diamond-shaped hole. A significant part of fibers predgornoe part goes to the rear longitudinal beam, Vestibulo-smenarny beam, and in the cerebellum. Fiber cochlear (acoustic) part, partially crossing, go in the composition of the side of the loop to the bottom tubercles of cetverokatnice and internal geniculate body. Here begins the Central auditory pathway, which ends in the crust of the superior temporal gyrus. When the auditory nerve diseases of different etiology, involving fiber cochlear part, affected the hearing, in violation of the vestibular portion of the auditory nerve experiencing dizziness, staggering walk with walking, nausea, nystagmus (see). IX couple language-glotocnogo nerves (n. glossopharyngeus), appears on the surface of the medulla oblongata from the outside, from the bottom of Oliva. His spine common stock leaves a cavity of a skull through the jugular hole. Sensitive the fibres in the nerve, the waste from the cells of the upper and lower units, end up in the kernel single beam at the bottom IV heart, nerviruet throat, middle ear, the back third of tongue. Motor fibers going from dual cores tires and nerviruet muscles of the pharynx. Parasympathetic fibers nerviruet parotid gland. If you are involved in pathological process IX pair found pain in the throat, the root of the tongue, difficulty swallowing, upset palate posterior thirds of the tongue, the violation of salivation.